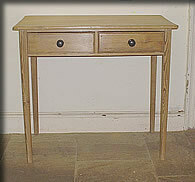 PLEASE NOTE Our pine furniture has a wax finish (unless otherwise stated). The camera flash bounces off the buffed wax which can make items on our website look a bit glossy or even varnished, depending on your monitor settings. If in doubt please ask. This table has the original slightly shappy colour on the base (see close-up as colour not showing well on the photo of whole piece) and we have left the top completely bare for now (waxed if required). 42"W (106.5cm) x 17 and 1/4"D(44cm) x just under 29"H(73ish cm). 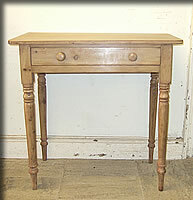 Cute unusually small size Victorian pine sidetable. In very nice condition and an even colour - camera flash makes it look uneven in this photo. 30"W x 28 and 1/2"H x 16 and 1/4"D. Kneeroom is 23"
REF JLI £155.00This one sold on 9/7/14 but we do have two similar ones approaching readiness - a little larger. 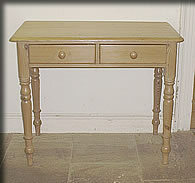 Victorian pine sidetable with one drawer. 32 and 1/2"W x 18"D x 27 and 1/2"H . A bit lower than average so a tall adult may find it too low. Good even pale pine colour - striplight above makes top look different colour. 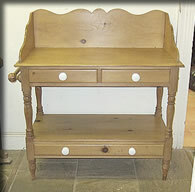 Lovely Victorian pine washstand. Quite pale pine. 43"W x 39 and 1/2"H x 20 and 3/4"D. In good original condition. 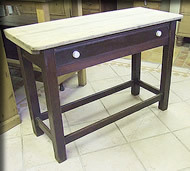 "COFFEE" TABLES, WHEN AVAILABLE, ARE ON DINING TABLE PAGE. 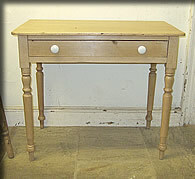 Victorian pine writing table/washstand with two drawers. Approx 48"W x 23 and 3/4"D x 29 and 1/2"H . Kneeroom if you wish to use as a desk is approx 23 and 1/2", adequate for most but do check. 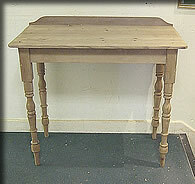 Good original table with original castors and in lovely condition.Fairly pale honey colour. 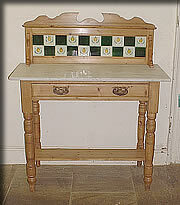 Late Victorian / Edwardian pine washstand with marble top and tiled splashback. See photo of the lovely blue and white tiles below. The marble is a grey-white and has some light scratches and age-dullness but generally in very good order without any nasty stains or chips/cracks. Not a pale pine but a bit lighter than in photo above. 43 and 1/2"W (including towel rail) x 19"D x approx 41 and 1/2"H.
Nice genuine early Victorian, possibly Georgian pine side table / writing table. Just over 32"W x 19"D x 29 and 1/4"H. Kneeroom is 23 and 1/4" - fine for some people/chairs but not others. Lovely simple authentic small table. 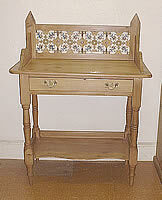 Late Victorian pine washstand with tiled splashback. Overall very good condition but there is some old evidence of woodworm (long gone and we treat everything anyway). 31"W x 40"H x 16"D.
Elegant Victorian pine writing table / washstand almost four foot wide with two drawers that would work well as a desk as it has good kneeroom for an antique table (almost 24"). 47 and 1/2"W x 31 and 1/2"H including the small gallery/upstand . (Just under 30" at work surface.) The depth back to front is approx 21". In lovely clean condition for its age - very smart. 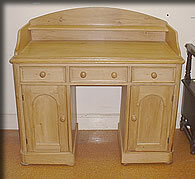 Super Victorian pine washstand with shaped gallery and towel rail to one side. It is unusual to have two drawers and also a drawer in the undertier. Nice all original item in very good condition. 38 and 1/2" at widest point but allow another 3" for the rail, 20 and 3/4" depth and overall height of 40 and 3/4"H. Fairly rich pine colour. The top surface is not a different colour to the rest, this is due to the striplight above. 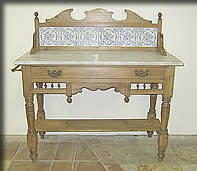 Late Victorian / Edwardian pine washstand with marble top and tiled splashback. Original art nouveau tiles below. Marble is white/grey. 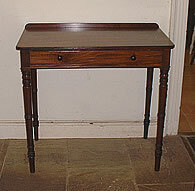 Victorian pine two-drawer - more of a writing table than a simple sidetable. 37"W x 30 and 3/4"H x just over 19 and 1/2"D. Good even colour - the flourescent light above makes top look different. Nice strong example in extremely good condition for its age. Elegant Victorian mahogany table. 34 and 1/2"W x 32"H x 19 and 3/4"D. Unusually this lovely table is quite high with masses of "knee room" - you may even want us to take a little off the height . The flash may make this look a little too "red" - it is a very warm colour tending towards brown rather than red.